After a morning hike in the mountains at Aurthur’s Pass, we hit the road in pursuit of the seaside Pancake rocks and Blowholes. 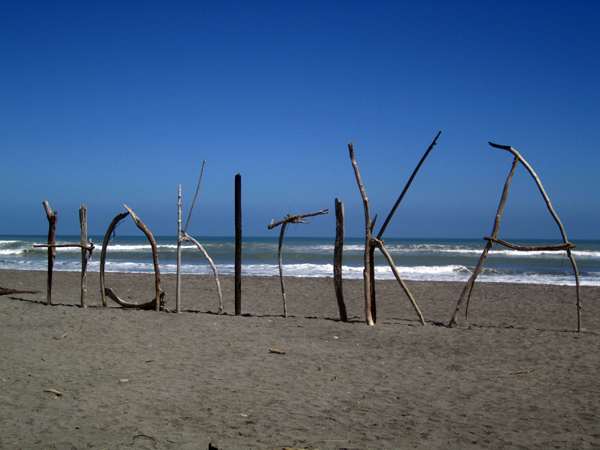 We headed south to Hokitika, which unfortunately was the wrong city in the wrong direction. We should have gone north to Punakaiki and the pancake rocks were nowhere to be found. 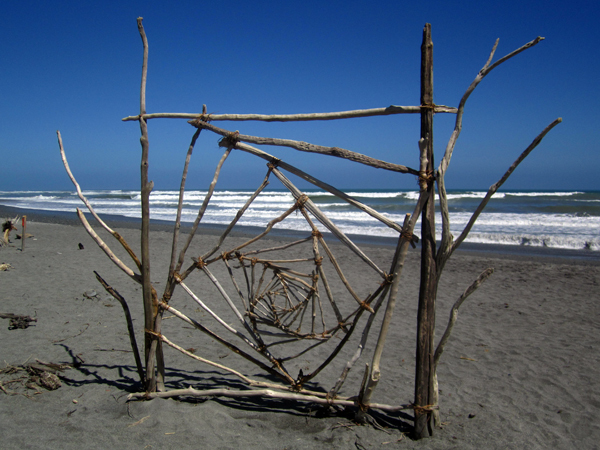 While we were disappointed when we realized our mistake, we were also pleasantly surprised to come across a driftwood sculpture building competition on the beach. 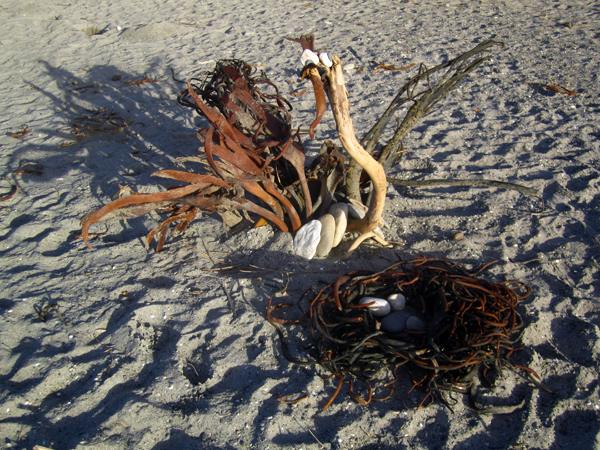 All along the beach, there were sculptures made from a variety of natural materials. There was driftwood, kelp, grass, rocks, flax leaves and more that I didn’t recognize. It was incredible, and the artists were obviously quite talented. It was very difficult to get a picture that did justice to their work. After exploring the display on the beach we turned around, and headed back up to our original destination of Punakaiki. Our campsite was right on the beach, and after dinner I went down there to read. 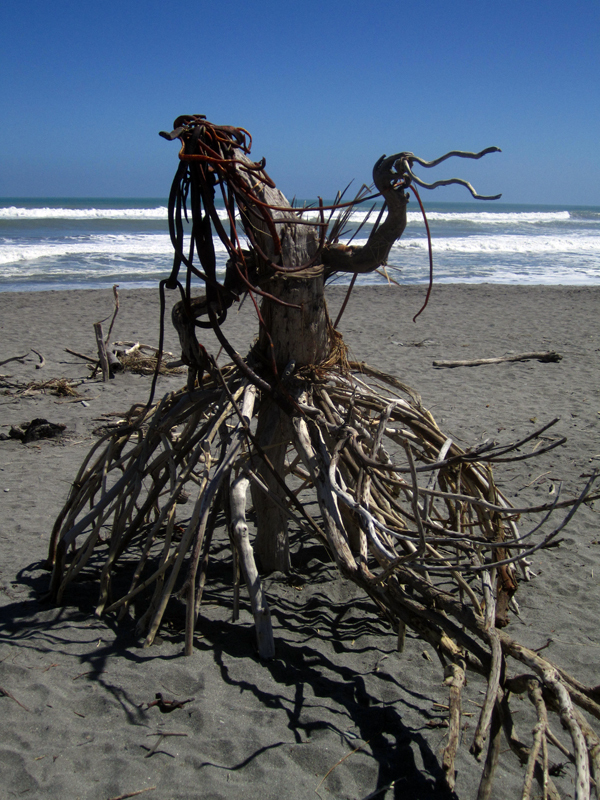 I noticed a bunch of driftwood, and became inspired to create my own sculpture. I decided on a googely eyed swan with a nest of eggs. When I was done, I sat down on the beach to take in the beautiful sunset and smiled as I saw three different people take pictures of my swan. In the end I was quite glad that we had accidentally ended up in Hokitika, and I have since recommended it to many other tourists I have met who are passing through. What a great story! One of many I’m sure, and a lesson too!! Sweet sculptures, sounds like a really cool sight! Hope you’re having a great time. It is beautiful there. I went clockwise.A few years ago I was going to take train from Greymouth on West Coast thru the pass to Christchurch on East Coast. Day before there was a coal train derailment there at Arthur’s Pass. As you know, climbing to more than 900 metres – is the highest and most spectacular pass across the Southern Alps. So had to take a substitute little bus up the western alps, go past the derailment and get on train to go down the eastern alps. You must have crossed over the alps because Hokitika is on west coast. is is possible to include a couple of links to the area you are in. Hokitika Gorge is wonderful. We could all just click and see where in N.Z. you are and also get a greater taste of the sights. I like the photo’s you have both taken so far. Pleasant mistake, but you twigged on very quickly.